I know for a fact that many people saw last week’s news item about the instruments used to embalm Elvis Presley going up for sale. I know this because many people (including my Mom…) e-mailed me the story. What I think most people missed was the announcement a few days later that the same sale had been called off. It’s true. The Presley embalming gear will not be auctioned in August. At the top of this post you will find a Chicago Tribune article announcing the sale’s cancellation as well as a statement by the auction house, Leslie Hindman Auctioneers, on what happened. 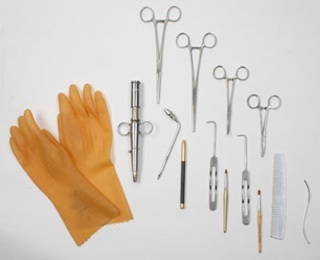 Here is a sampling of the items from the defunct sale: forceps, needle injectors, aneurysm hooks, an arterial tube, lip brushes (for makeup), rubber gloves, a comb, eye liner, and a toe tag. I’ve even included a photo of some of the gear. I, however, had an entirely different reaction. Since I am a Death Studies Professional my first thought was “No way. It’s fake.” There is absolutely no way to prove the provenance and authenticity of this embalming equipment (short of DNA traces, if that’s even possible) since everything listed could be bought from any embalming supply company. Some written materials were also included in the sale but I did not see any images of the documents. And, lo, it turns out that the authenticity of said embalming instruments became an issue after the initial news story drop. As a result, the auction house could do nothing but pull the sale. There is another angle on this entire debacle. It turns out that the Memphis, TN funeral home which questioned the authenticity of the instruments is owned by the Texas based Service Corporation International (SCI). I’ll take SCI at its word that the privacy, dignity, and respect of the Presley family is important but I also think that SCI wanted to hang onto this property. If these embalming tools are authentic (which I still doubt) then it’s the kind of thing any corporation wants in its private holdings. Interesting enough, Leslie Hindman Auctioneers pulled the original sale announcement off its website. You can that here. Our good friends at BoingBoing, however, still have that posting up. So there you have it. Buyer beware. Especially when dealing with run-of-the-mill embalming equipment. Posted by John in Death + Popular Culture, Death + the Web, Funeral Industry and tagged celebrity death. Bookmark the permalink.